The California Coastal Commission will decide whether 1.3 miles of the Coastal Rail Trail through Cardiff will be located east or west of the railroad tracks at a public hearing on May 11. The outcome will be significant for Encinitas. The question they’ll be answering is whether to allow placement of the rail trail along Highway 101 (the city’s preferred placement), or whether the bike path must be constructed in the dirt on the east side of the railroad tracks through Cardiff. No other segments of the rail trail are at issue right now – only the section from Chesterfield to Santa Fe Drive in Cardiff. 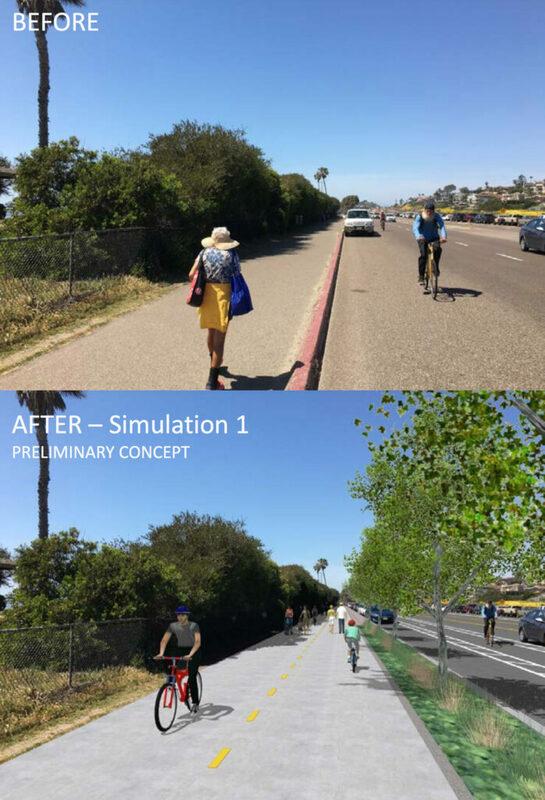 I’ve included pictures here showing you the existing facilities along Highway 101, with SANDAG’s proposed improvements for the rail trail at the same locations. Additional pictures of the existing conditions and the proposed rail trail improvements are below. This crucial choice is essentially coming as an appeal to the Coastal Commission, because the Coastal Commission staff is opposed to the city’s (and SANDAG’s) favored alignment along Highway 101. Winning this one isn’t a slam-dunk – the Coastal Commission board must overrule its own staff in order for our Highway 101 alignment to be approved. Our argument is that placing the bike path along Highway 101 will more successfully achieve the goals of the project than placing the bike path east of the railroad track. The bike lanes to our north in Carlsbad and Solana Beach to the south run along Highway 101. We want to continue the path along the routes folks are already using, and not force them to detour inland. Logically, it makes sense for this bicycle highway to be on Highway 101, where the ground is already paved; it’s a more direct route for bike commuters, and cyclists won’t have to cross the railroad tracks and navigate the intersection at Chesterfield. And it goes without saying that it’s a stunningly scenic route overlooking the ocean bluff. Surveys indicate that people opt for pedaling instead of driving when they feel safe. The project along Highway 101 will separate bikes from cars using a barrier which will create a greatly enhanced sense of safety. This project is one small part of a larger one that aims to improve transportation overall. Adding lanes to the freeway increases car trips, and adding bike lanes creates more bike trips. Because SANDAG is currently adding a carpool lane in both directions on the freeway in Cardiff, the agency has to add a separated bike path in order to help offset the carbon emissions that result from more car trips. 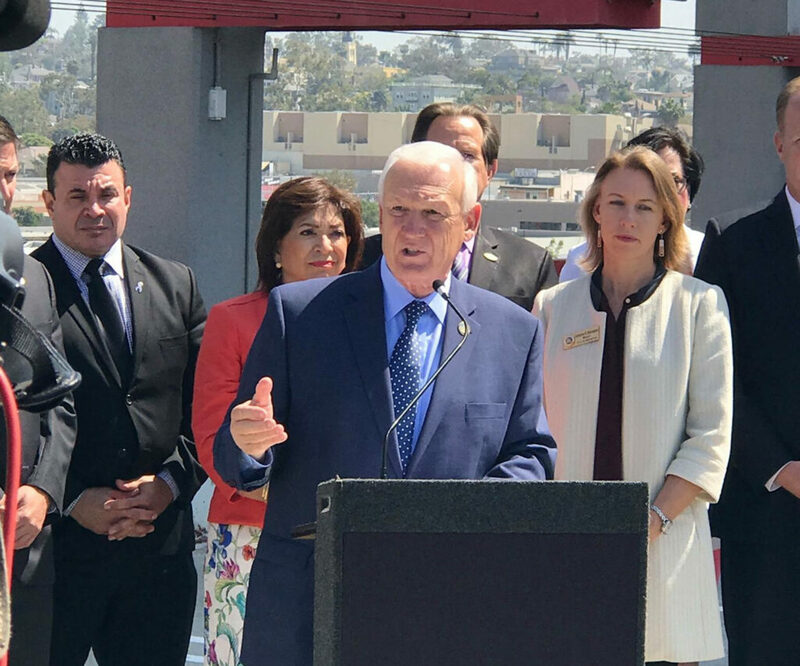 This planned and partially-constructed 40-mile bike path from Oceanside to San Diego is a “regional facility,” which means it’s consistent across each city and eventually will run the length of the county. This bike path is not intended to be a meandering, slow-moving scenic dirt path for walkers – it’s designed to be a bicycle highway. SANDAG is required to build this section of the coastal rail trail somewhere near the railroad tracks in order to complete its obligations. Doing nothing is not an option. I still believe that we need to improve the rail corridor and the adjacent San Elijo and Vulcan Avenues. However, this SANDAG bike highway is not the project to accomplish that goal. SANDAG’s project has specific requirements that are not very flexible. We want the city, not an outside regional agency, to be able to design and control the ultimate look and feel of the improvements in the rail corridor. In the rail corridor, we need a continuous but natural path system, more crossings, quiet train horns and more organized parking, along with re-vegetation, particularly in Leucadia. Design elements, plus specific plans for a whole corridor vision, should emerge from the Coastal Mobility and Livability Working Group made up of local residents who’ve been conducting ongoing meetings. Eventually it will be up to the City Council to approve any project in the rail corridor and prioritize its funding. At our strategic planning a couple weeks ago, it was clear that the City Council appears to have consensus that the top priority for the rail corridor is quieting the train horns. At our last City Council meeting we spent a fair amount of time swimming in planning and engineering details related to quiet zones, then we unanimously approved a $232,000 contract for the next step – a Quiet Zone Feasibility Study. I believe an improved Highway 101 will be loved and well-used, not just by cyclists but dog-walkers, parents with strollers, and families with young children. Together with the SANDAG staff, I’m working hard on our presentation to the Coastal Commission in 11 days and I sincerely hope we’re successful! • We unanimously passed a tree ordinance after four drafts and a multi-year public-outreach process. The ordinance only applies to protecting city trees and doesn’t deal with trees on private property unless a landowner has voluntarily designated a tree as a heritage tree with protected status. 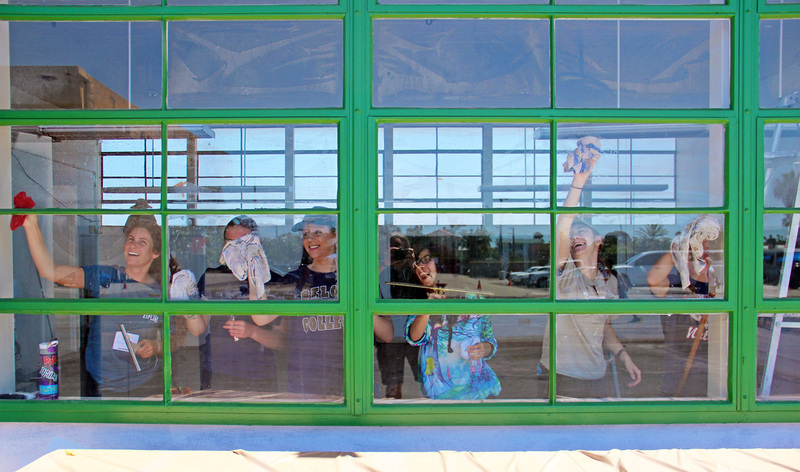 • Our next Ad-hoc Housing Element meeting has been postponed from this Tuesday to May 4th at 4 p.m. at City Hall, where we’ll interview the consultant we’ve chosen to help us achieve a new plan for housing. Given the early start time you could still make it to the Taste of Cardiff, which is always a great time. May the Fourth be With You! • We’ve opted to extend our city mediation program for another year even though no two parties actually utilized the service in the last 12 months. While this was a disappointment, we did have 21 requests/inquiries to use the program involving many different community issues, including view blockage, spite hedges or fences, animal waste, property line encroachments, senior center participant disagreements, noise, a conflict between a property owner and a cell provider, and a land use case related to a proposed car wash.
Having the program and creating a dialogue around the issues that would be discussed in a mediation can have a positive influence on resolving a dispute before it consumes the time and attention of the Sheriff, code enforcement, city staff and elected officials on a divisive appeal. If you’re having a problem with your neighbor and you’d like to try city mediation at no cost, you’ll find more information here. The fourth annual Encinitas Arts Festival was just as fun and successful as in previous years. 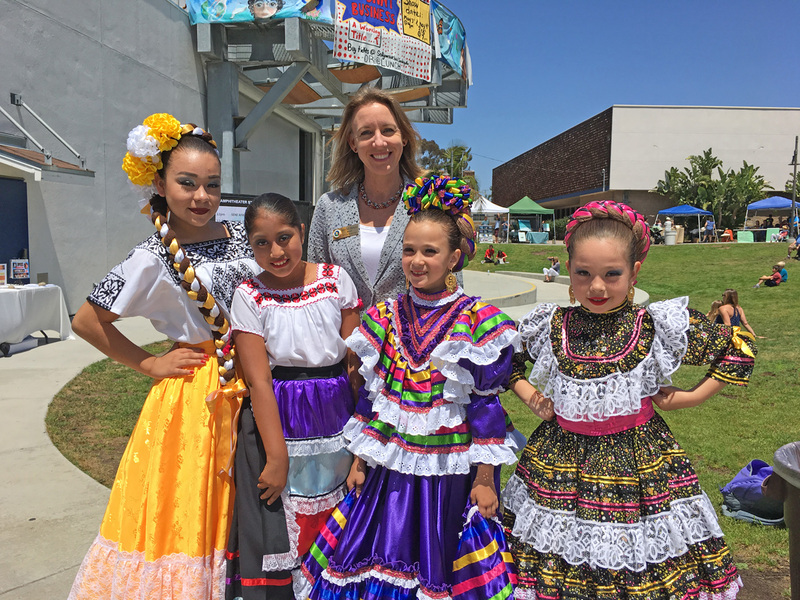 It’s a community-scale performance and visual art event at San Dieguito Academy featuring Ballet Folklorico, Encinitas Ballet, Fern Street Circus, Ovation Theatre, Vocalocity, Parkdale Players and others. A delightful, low-key event that I really enjoy. When I decided to run for mayor, I looked around for books that delved into the role, the work, and the ideal of what a mayor is and does. There are surprisingly few books in this category, but one of the most noteworthy is the book, If Mayors Ruled the World by Benjamin R. Barber, who died last week after publishing his 17th book just days before his death. Noted academics considered him a preeminent political theorist.